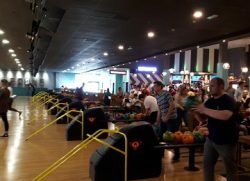 Celebrations for our second End of Quarter for 2018-19 took place on Friday 5th October with a return to the bowling alley and our first Compass House Party in the evening. A total of eight teams competed across Compass Holding Group and battled it out to be the best bowling team. After two games, Team 8 emerged victorious with some huge scores. Well done to Maria Saunders, Adam Hodges, Rebecca Taylor, Stuart Cousins, Grant Mélin, Luke Ramshaw, Chloe Galbraith and Ani Abello. The evening's festivities were held at Ashby's Southsea where employees could take part in a game of table tennis, air hockey, pool or table football or have a boogie to the tunes being spun by DJ Mark B. More promotions at Compass Associates! We are delighted to announce five promotions across Compass Associates. Following their recent REC Level 3 Certificate in Recruitment Practice exam passes, Gemma Lee and Grant Mélin from our Care Home division, Holly Davies from our Specialist Services division, Adam Hodges from our Corporate Services function all celebrate a promotion to Senior Consultant. Cassie Pay from our Business Support team has also passed her CIPD Level 3 Certificate in Human Resources Practice and has been promoted from HR Assistant to HR Advisor. Sam Leighton-Smith, Director of Healthcare comments: "A raft of promotions in Q2 saw Holly, Grant, Adam and Gemma all become Senior Consultants along with Cassie who is now a HR Advisor. The first 4 are off the back of passing their REC, a now rigorous examination of recruitment capability. This is a real coup for the company for a multitude of reasons. It demonstrates we are developing and investing in our teams, from a brand projection we now have more senior, qualified staff and lastly, from a client perspective we are comforted with the fact that they are dealing with more and more experienced consultants within our ranks.